In one week, Samsung will release the Galaxy Fold, the first foldable phone available to consumers. The South Korean tech giant has begun showing off the phone at pre-launch events around the country, which means we got our hands on this innovative device and we’re ready to tell you all about it. 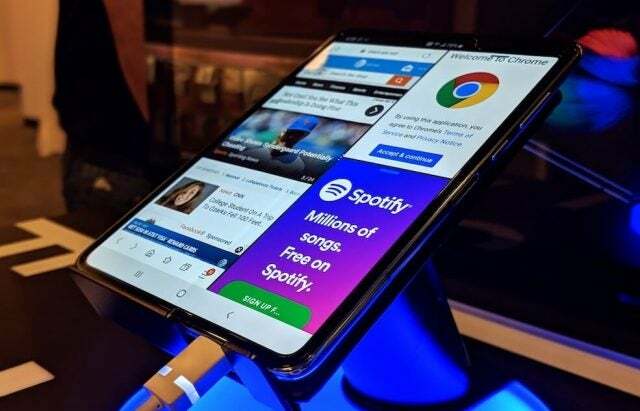 Samsung has teased the ambitious foldable screen technology at a myriad of events over the last few years to excited cheers. While their announcement event made a lot of bold claims, the prospect of a foldable phone was enough for us all to shove any skepticism under the rug for the foreseeable future. However, as leads began to come out, potential first adopters began to see the downside of being an innovator of new technology. Rumors of massive creases, broken screens, and bulky designs have plagued Samsung, making them pretty defensive before the phone has even launched. For a better look at exactly how this phone works and what it feels like, take a look at our in-depth review below and check out our best phones for 2019 guide for more great devices! Does the Galaxy Fold Have a Crease? While the foldable interface was as seamless as Samsung insisted, there was one glaring issue that made it hard to take it seriously; one hugely problematic aspect that was assured, nay, promised not to be too noticeable. And I spotted it from across the room. So does the Samsung Galaxy Fold have a crease? Unexpectedly, undeniably, unequivocally yes! 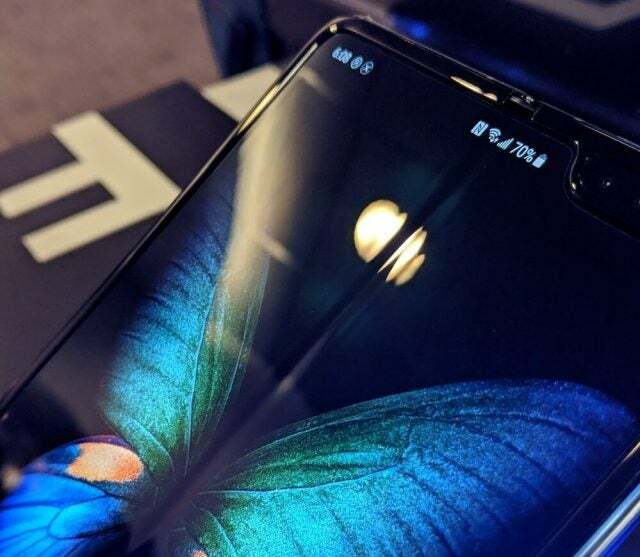 The second we unfolded the Samsung Galaxy Fold, a huge, glaring crease could be spotted from pretty much every angle. You could feel it, you could see it, heck, it was so obvious you could almost smell it. Even while displaying Samsung’s now signature butterfly image, the innovative device brazenly brandishes the one thing they were trying to avoid when it came to foldable phones. This was at least somewhat expected though. Between the problematic leaks, the unsettling rumors, and the CEO of Huawei insisting the tech is impossible without a crease, the likelihood of a crease-less device hitting the shelves was understandably low. Still, after months of Samsung insisting this kind of innovation was possible, it’s hard not to be disappointed when you see a cavernous valley splitting the middle of your almost $2000 smartphone. 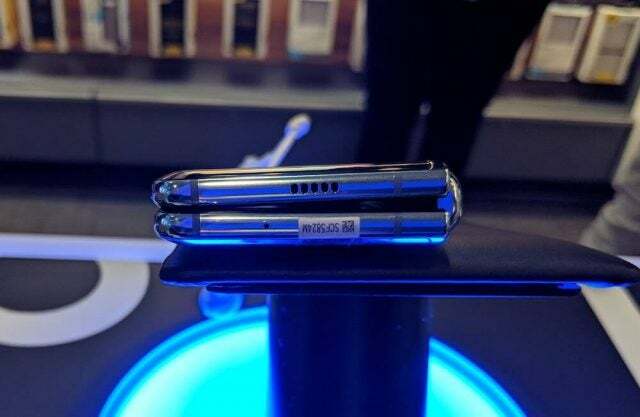 Just because Samsung didn’t back up their most important promise in regards to foldable screens, doesn’t mean the Galaxy Fold doesn’t have its moments. For one, the intuitive interface really does make it easy to take advantage of the new technology. Swapping between the folded and unfolded interface was truly as quick and seamless as Samsung demonstrated at their announcement, and it doesn’t just work on your favorite apps. To put the interface to the test, we opened up Chrome and visited the ESPN website, an online labyrinth of links, displays, and galleries that certainly puts a strain on my phone when I open it. Much to my delight, the Galaxy Fold effortlessly allowed me to switch between skinny phone and small tablet mode on the page without issue. Additionally, the unique keyboard on the unfolded version is a solid decision by Samsung, giving users a typing experience akin to the old Blackberry feel: two-hands on the device, all thumbs. However, if you’ve gotten used to swipe typing, which at this point many of us have, you’re going to have trouble readjusting to this stretched layout. Outside of the crease, the Galaxy Fold does boast a few other notable flaws that will likely prevent it from gaining massive popularity. For one, it’s a bit bulky and decidedly heavy. This what obviously going to be the case, as multiple batteries and all that added screen space add up. However, from an objective standpoint, that will be a serious deterrent for some users, particularly those with thin pockets. The primary contributor to this bulkiness problem is that, as you see here, when the phone is folded, the screen isn’t flush against the body of the phone. This kind of design might have flown in the early 2000s. But in 2019, when sleek design rivals intuitive interface as the most sought-after feature on any mobile device, you’re going to have a hard time pitching a foldable smartphone that looks like a three-ring binder. Truthfully, you probably shouldn’t buy the Galaxy Fold, at least not right away. Even if the crease doesn’t bother you, review devices have been breaking almost immediately for a wide range of reasons. The smartphone, as you may have heard, comes with a screen protector that looks like the plastic film you’re supposed to remove after purchase. However, when removed, the edges of the screen immediately begin to crack and your device is effectively the most fragile piece of tech you’ve ever owned. Simply put, this is brand new technology that is obviously incredibly hard to get right, and the first attempt is just not where you want to start. Hopefully Samsung, and other brands rushing to make a viable device, can learn from these follies and put out a foldable phone in the future that deserves your $2000. The post Samsung Galaxy Fold: Hands-On First Impression appeared first on Tech.co.